EUGENE, Ore. – No, you don’t have to refresh your browser. 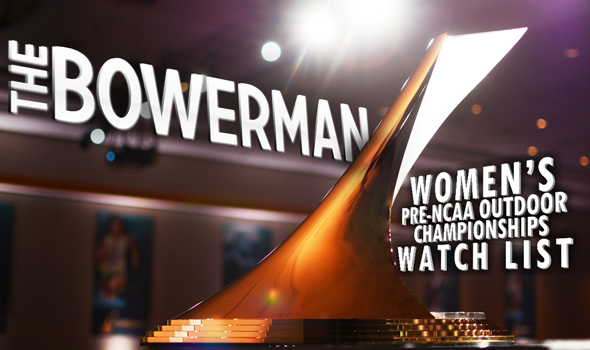 In what was a rare occurrence, the NCAA Pre-Outdoor Championship Watch List for The Bowerman – released on Tuesday by the U.S. Track & Field and Cross Country Coaches Association (USTFCCCA) in conjunction with TrackTown LIVE – featured the same 10 women who were on the previous edition of the Watch List back in mid-May. The inactivity between Watch Lists marked the first time that has happened all season, but each athlete was anything but stagnant since May 16. The NCAA Division I East and West Prelims featured outstanding performances from those who grace the Watch List. All 10 will begin their quest for a national title on Thursday at Historic Hayward Field during the NCAA Division I Outdoor Track & Field Championships. Quanesha Burks SR Alabama Jumps Hartselle, Ala.
Aleia Hobbs JR LSU Sprints New Orleans, La. Deajah Stevens JR Oregon Sprints Westchester, N.Y.
Ariana Washington RS SO Oregon Sprints Signal Hill, Calif.
Oregon’s Deajah Stevens put together one of the strongest outings of the 10 at the NCAA Division I Prelims, as the native of Westchester, New York recorded the top qualifying times in the country in the 100 meters (10.89) and the 200 meters (22.16). Her wind-aided mark of 10.89 in the 100 meters ranks as the 3rd-best wind-aided time in the event in collegiate outdoor history. Maggie Ewen also dominated during the NCAA Division I Prelims, as the Arizona State product became the only woman on the Watch List to qualify for nationals in 3 individual events. Ewen notched the best hammer throw mark of any NCAA qualifier with a toss of 70.81m (232-3) in addition to tossing the 2nd-best shot put distance at the NCAA West Prelims at 17.72m (58-1¾). The native of St. Francis, Minnesota also hurled the discus 58.48m (191-10) to finish 4th in Austin, Texas. Joining the duo with multiple individual-event qualifying marks were Georgia’s Keturah Orji, Alabama’s Quanesha Burks and Oregon’s Ariana Washington. Like Ewen and Stevens, Orji also owns an NCAA-leading qualifying mark in one of her events. The product out of Mount Olive, New Jersey posted a triple jump mark of 14.09m (46-2¾) in Lexington, Kentucky that bested any other leap in that event amongst all 24 NCAA qualifiers. Additionally, Orji’s mark of 6.59m (21-7½) in the long jump was good for 7th amongst all long jumpers who will compete in Eugene. Washington will compete in 2 events on her home track, as the native of Signal Hill, California qualified in the 100 meters and 200 meters like her teammate Stevens. Washington ran an 11.08 in the shorter of the two races, followed by a time of 22.44 in the 200 meters. Unlike the aforementioned athletes, Burks will compete on the track and in the field. The Hartselle, Alabama product placed 2nd in both the long jump (6.68m/22-11) and the 100 meters (11.44) in Lexington. Additionally, Burks was on the Crimson Tide’s 4×100 relay squad that finished 3rd at the NCAA East Prelims with a time of 42.91. LSU’s Aleia Hobbs, Oregon’s Raevyn Rogers and Shakima Wimbley of Miami (Fla.) will all compete in an individual event, as well as a relay in Eugene. Hobbs, a product out of New Orleans, ran the 4th-fastest 100 meters at the NCAA Division I East Prelims with a finish of 11.32. However, Hobbs also guided the Tigers’ 4×100 relay team to a time of 42.32 to lead all qualifiers. Rogers’ time of 2:05.72 in the 800 meters stood 3rd at the NCAA West Prelims, while the native of Houston helped the Ducks’ 4×400 relay team place 2nd among all qualifiers with a finish of 3:28.28. Wimbley will take part in 3 events, including the 400 meters where her time of 51.23 led the way at the NCAA East Prelims. The Fort Lauderdale, Florida product will also take part in the Hurricanes’ 4×100 and 4×400 relays. In Lexington, Wimbley and her teammates finished the 4×400 relay in 3:30.47 while wrapping up the 4×100 relay in 43.68. Rounding out the Watch List is Mississippi’s Raven Saunders and Georgia’s Kendell Williams. Saunders mark of 18.04m (59-2¼) in the shot put paced the NCAA East Prelims. Williams, who extended her Watch List appearance record to 24, declared for the heptathlon, but did not compete at the NCAA Division I East Prelims. Receiving votes was Kentucky’s Sha’Keela Saunders, Baylor’s Annie Rhodes and Southern California’s Kendall Ellis. Be sure to watch the 2017 NCAA Division I Outdoor Track & Field Championships live on the ESPN family of networks from Wednesday, June 7 to Saturday, June 10. Both the final day of the men’s championship and women’s championship will be aired in prime time on ESPN.